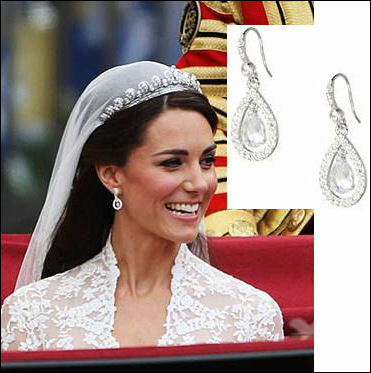 Kate Middleton wore an Alexander McQueen wedding dress when she said ‘I do’ to Prince William. 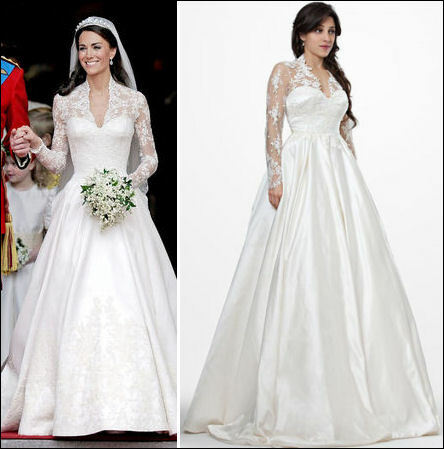 You can feel like a princess too in this replica by JS Collections called “The Duchess” which will be available in stores on September 15, 2011, but can be pre-ordered today. Nordstrom.com, $698. You don’t have to spend a fortune on the earrings, but you can fake it with these. The Christina Crystal Teardrop Earrings, Carolee.com, $32. Some think Kate’s second Alexander McQueen gown is prettier than the first. What do you think? Like it, then steal the look with this silk organza ball gown. Theia gown, TheiaCouture.com for store locations, $1995.